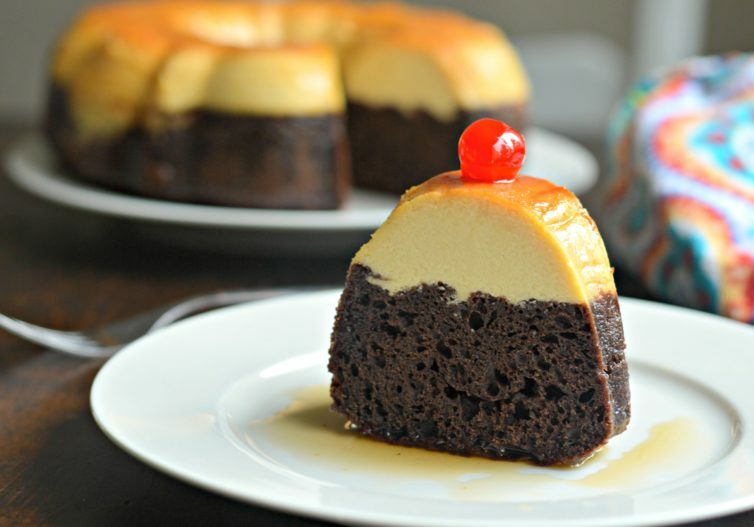 Inside: Find out how to make Chocoflan, which combines the creaminess of flan with the richness of chocolate cake for an all-in-one dessert that you will love. This method is different from the traditional method which results in a cleaner, creamier, and more firm dessert that you will love. We love making and eating desserts in my house. Since moving to the United States, I have come to enjoy many different recipes that I never tried in Mexico. That said, I still love some of the classic Mexican desserts that I grew to love growing up in Mexico. One of those recipes is what is known as chocoflan. 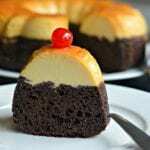 As the name suggests, chocoflan is a fusion of chocolate cake and flan. The combination of these two classic desserts is absolutely delicious and always a hit when we make it. If you make it right, you will have a piece of flan and chocolate cake in every bite, which is so tasty! Another name for this delicious Mexican dessert is “impossible cake”, but I can assure you that it is possible to make. The combination of a dense dessert like chocolate cake with a lighter, smooth dessert like flan is what gives it this name. Although it might look a little bit difficult to make, if you follow the instructions in this recipe you can be certain that it will turn out perfectly every time. 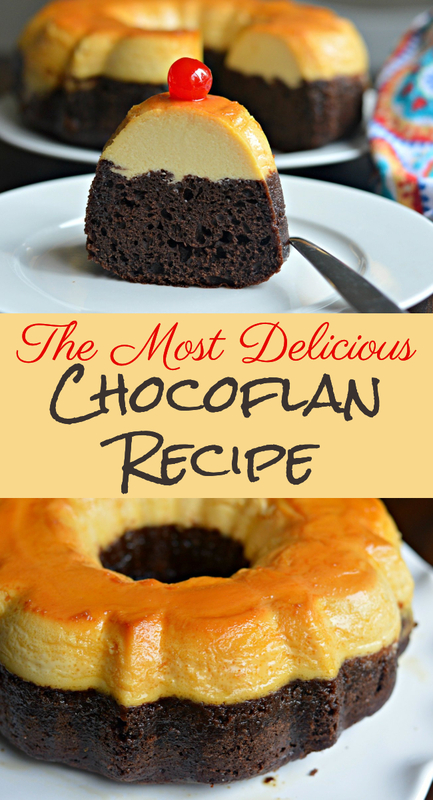 How Do You Make Chocoflan? The traditional method for making chocoflan is as follows. You start by making the caramel sauce, which is a very important step in the process. You do this by adding a cup of sugar to a pan and cooking over medium heat until it melts completely. It should have a light to golden brown color. This goes in the bottom the bundt pan that you are using for the chocoflan. Next, you blend a combination of milks and cream cheese for the flan section, and separately you prepare the chocolate cake batter. You then add them both together in the bundt pan and bake them together. When you use the traditional method, the chocolate portion and the flan portion will separate while they bake. This, however, is where my method differs from the traditional. I used the traditional method for years, but to be honest I was never really satisfied with the final presentation. The reason is that the flan section always seemed to be darker in color than I would like because of the process of the chocolate cake separating from it. I learned a new method after a while, and it is the one that I still use today. The new method is to cook the flan first in the bottom of the bundt pan until it is partially cooked (not completely firm though). Then, I add the chocolate cake batter on top of the flan and finish cooking them together. The reason that I like this method more is that the flan comes out cleaner, smoother, firmer, and more creamy! Finally, you will let it cool for sometime before releasing it from the bundt pan. The resulting chocoflan will have chocolate cake on the bottom and flan on the top. It really is a beautiful dessert and everyone will think that you spent hours baking it! 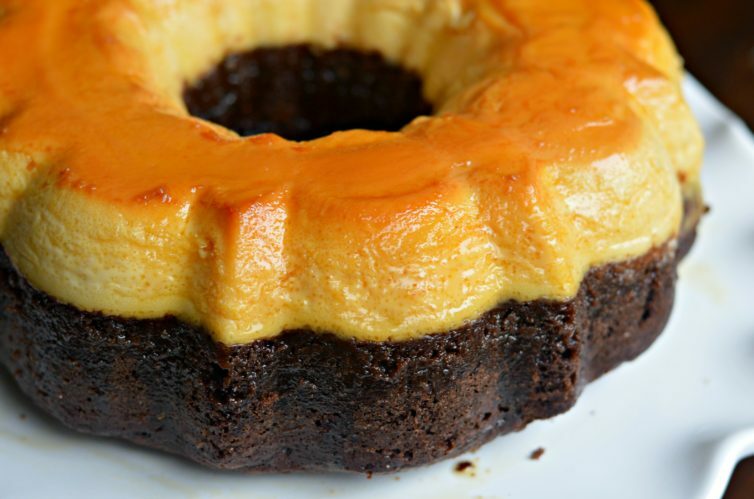 Chocoflan is perfect to serve at gatherings with friends and families because it can serve a crowd. Every time that I have made it, everyone has loved it and there hasn’t been much left at the end of the night. Make sure you try this recipe and let me know how it turns out in the comments below. 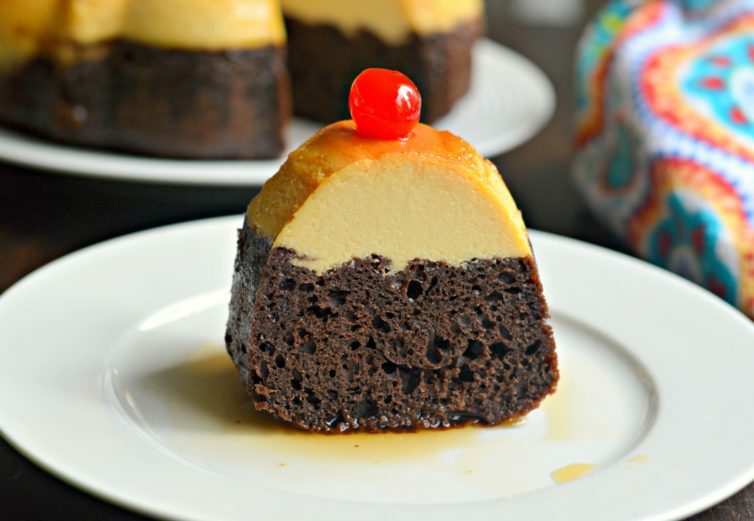 Find out how to make Chocoflan, which combines the creaminess of flan with the richness of chocolate cake for an all-in-one dessert that you will love. Add the sugar a non-stick pan over medium heat. The caramel will start to form within about 5 minutes, but it is important to stir constantly to prevent lumps. It is normal for it to start forming lumps at the beginning and then it will start to melt and once it has dissolved completely and has a golden brown color, it is done. Pour the caramel into a pre-greased bundt pan and carefully move it from side to side so that the caramel covers the bottom portion of the bundt pan (as shown in image). Please use oven mitts for this part, because adding the hot caramel to the bundt pan will heat it up in a hurry and you don't want to get burned. Let cool for at least 10 minutes before adding the flan mixture. Add the flan mixture to the bundt pan where you already added the caramel. Cover the bundt pan with aluminum foil and cook using the water bath method for 35 minutes in the oven at 375 degrees F or until the flan is partially but not completely firm. Prepare the batter according to the package instructions. Pour the batter into the bundt pan on top of the partially cooked flan. Bake at 375, uncovered, for an additional 40 minutes, or until a toothpick comes out clean. Let cool for at least one hour in the refrigerator before removing as this will make it easier to remove the chocoflan from the bundt pan. 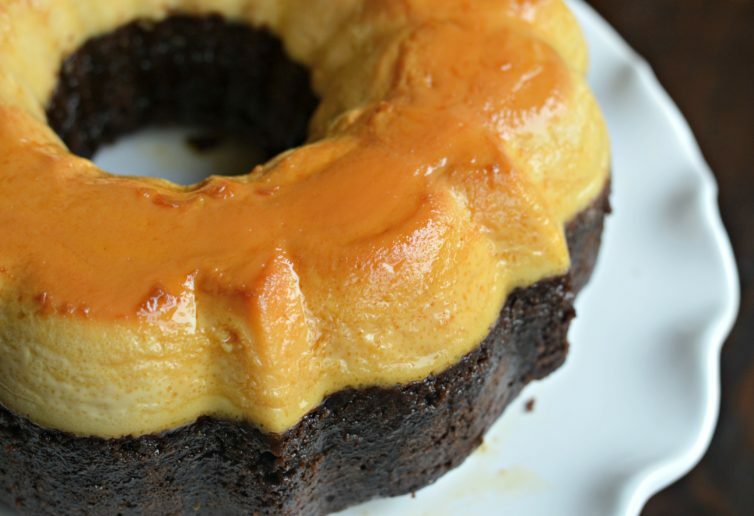 Remove from the bundt pan and enjoy your perfect chocoflan! For the water bath, make sure that you are using hot water. Also make sure not to add too much so that it doesn't reach the top of the bundt pan. If the water enters the bundt pan, it could ruin the consistency of the flan. 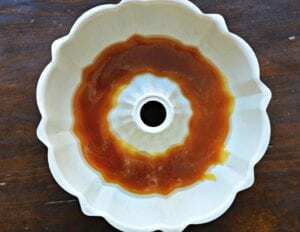 For the traditional method, follow the same instructions for the caramel sauce, but instead of cooking the flan first, add the chocolate cake batter first, and then add the flan mixture and bake for about 1.5 hours using the water bath method. 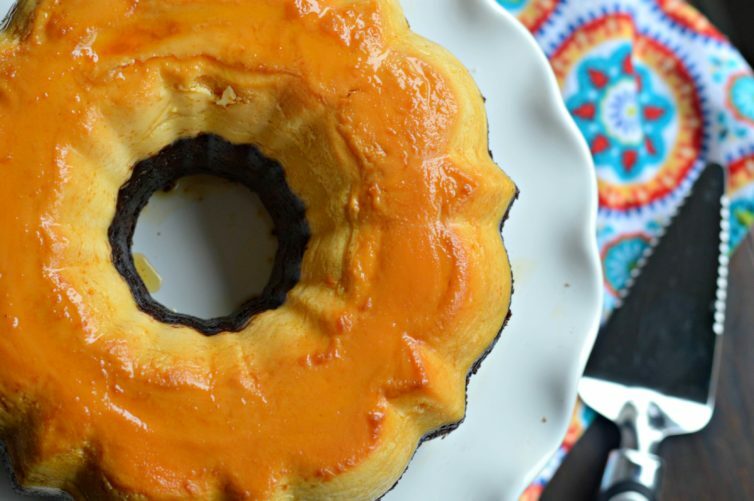 Using the traditional method, some of the coloring from the cake will cause the flan to have a darker color. It still tastes amazing, but this method results in a cleaner flan. I am so happy to see you spread the pride, joy, and love of the mexican culture through your presentations. I am an old fat Gabacho who was born and raised in Southern New Mexico and I love the food, the music, the art, but most of all the people. Thanks for making my day a wonderful one. Would love to make this, however, what is “table cream” ….. have never heard of this.